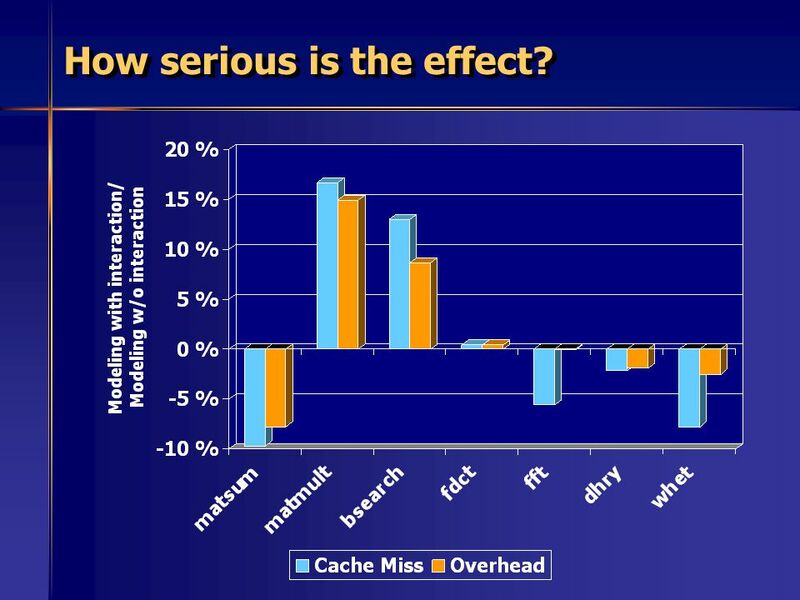 9 How serious is the effect? 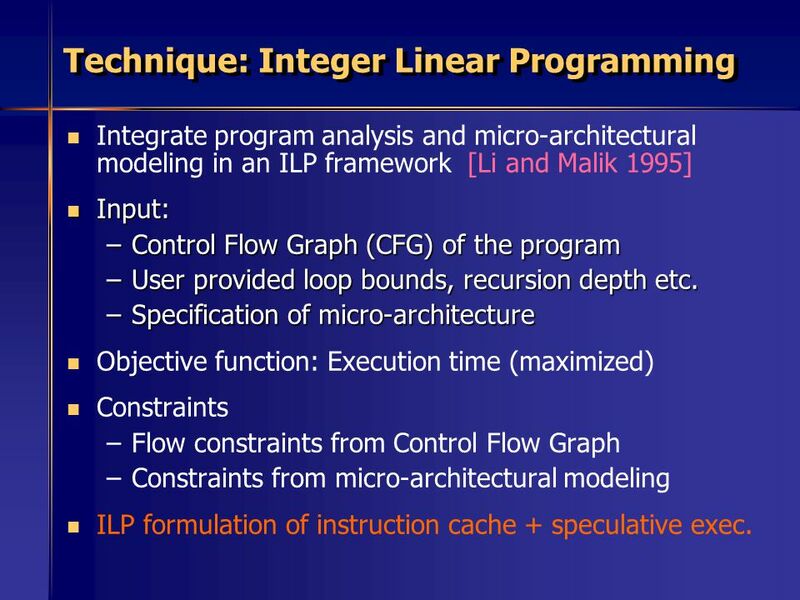 Integrate program analysis and micro-architectural modeling in an ILP framework [Li and Malik 1995] Input: Control Flow Graph (CFG) of the program User provided loop bounds, recursion depth etc. 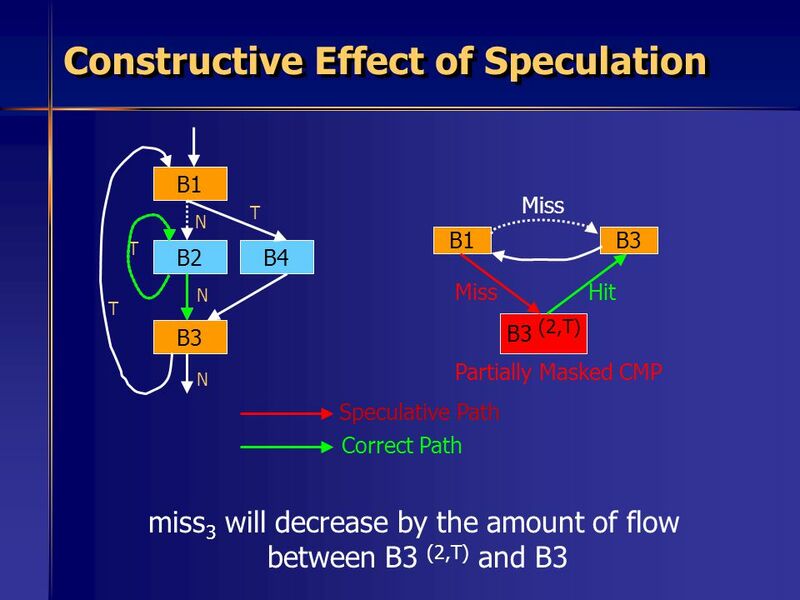 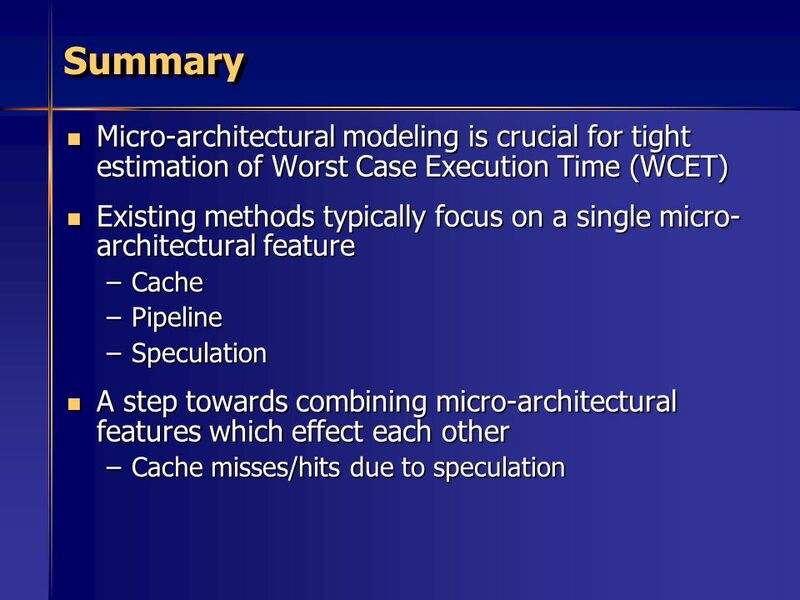 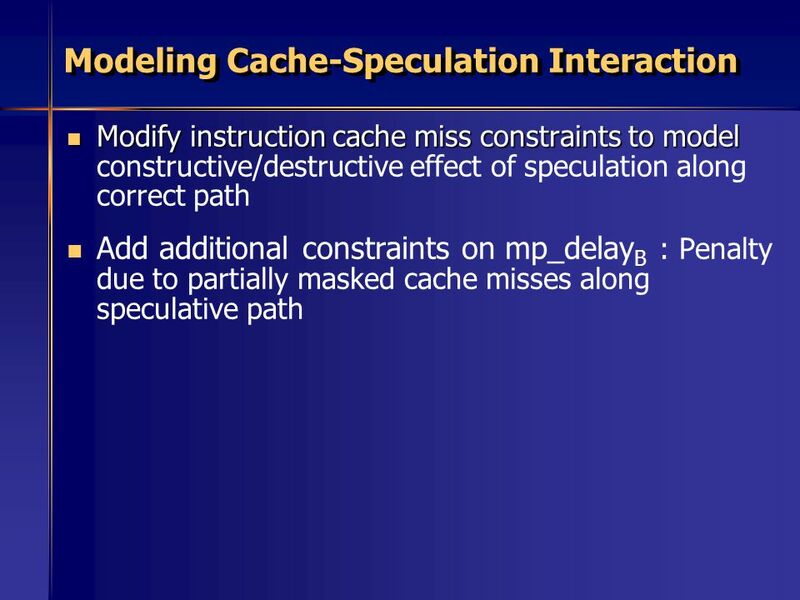 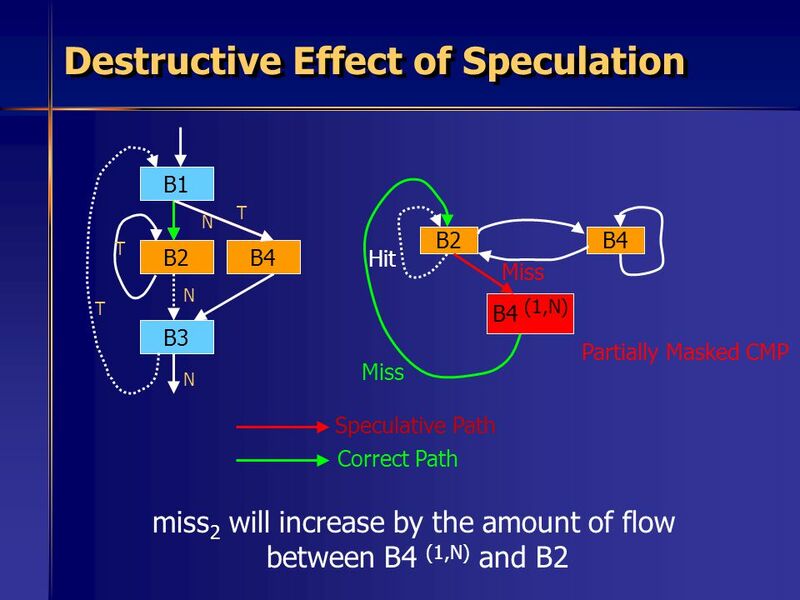 Specification of micro-architecture Objective function: Execution time (maximized) Constraints Flow constraints from Control Flow Graph Constraints from micro-architectural modeling ILP formulation of instruction cache + speculative exec. 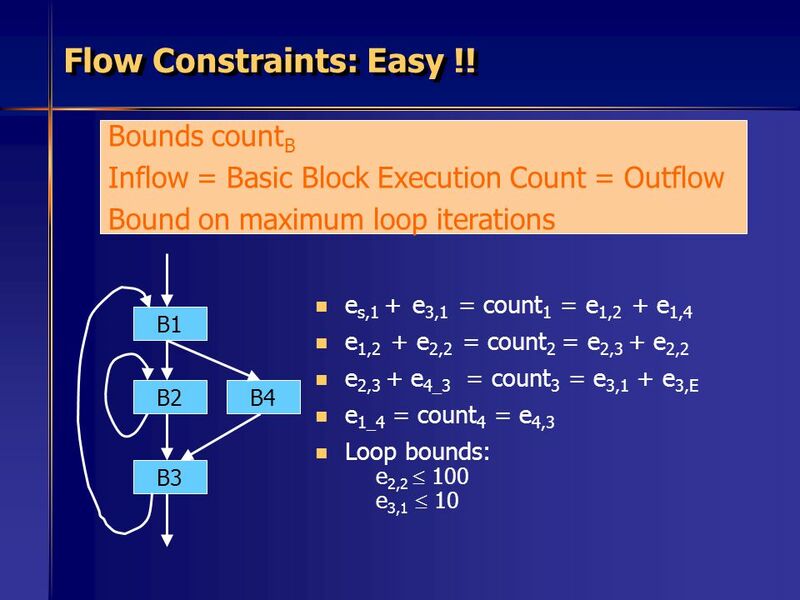 12 Flow Constraints: Easy !! 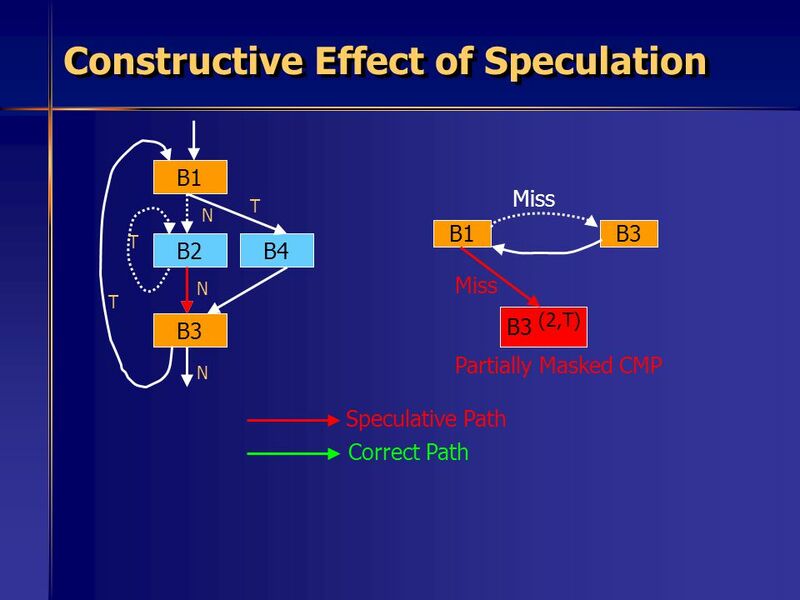 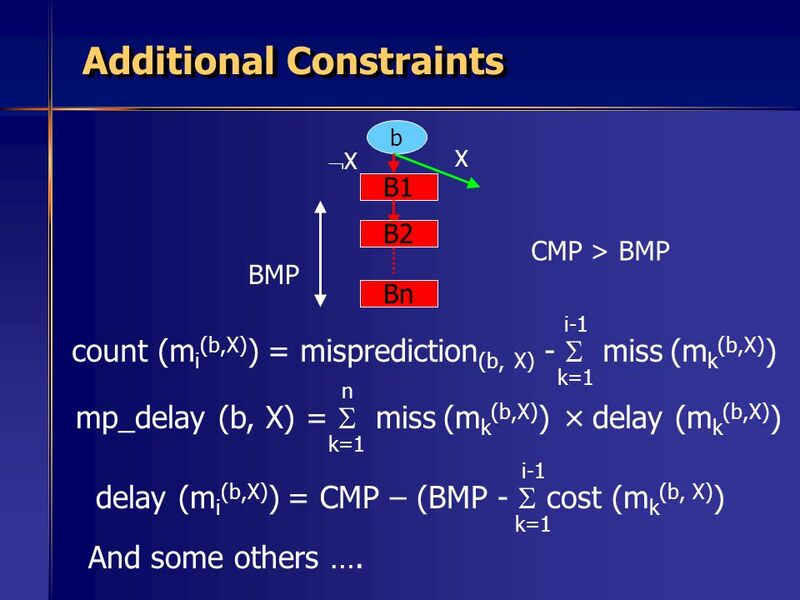 b X X B1 B2 CMP > BMP BMP Bn i-1 count (mi(b,X)) = misprediction(b, X) -  miss (mk(b,X)) k=1 n mp_delay (b, X) =  miss (mk(b,X)) × delay (mk(b,X)) k=1 i-1 delay (mi(b,X)) = CMP – (BMP -  cost (mk(b, X)) k=1 And some others …. 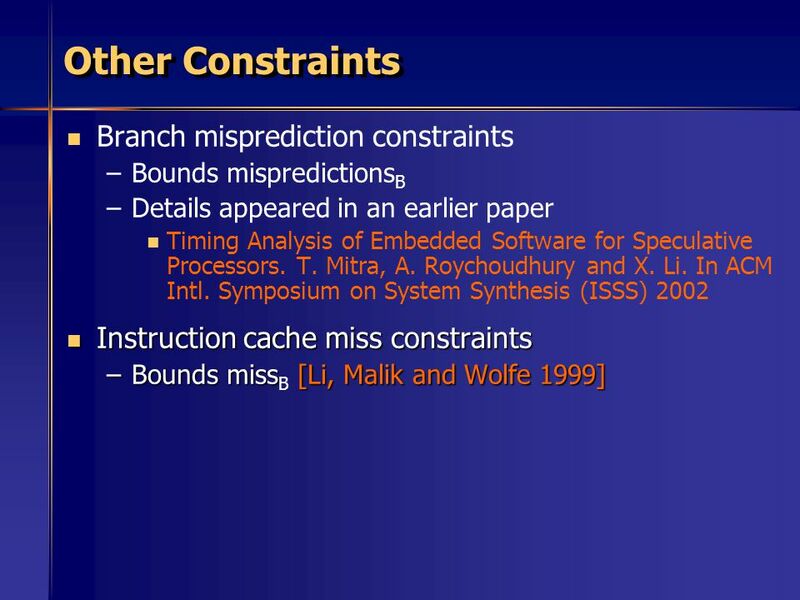 Download ppt "Xianfeng Li Tulika Mitra Abhik Roychoudhury"
© 2004 Wayne Wolf Topics Task-level partitioning. 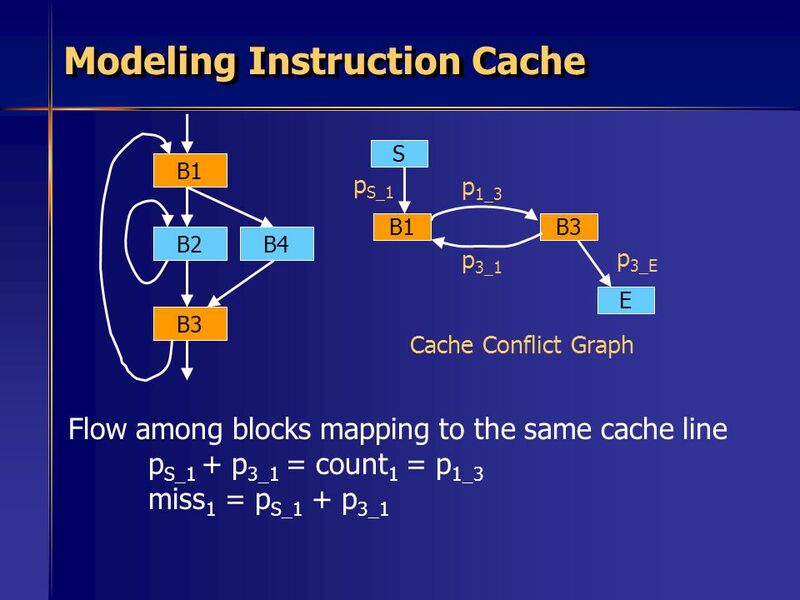 Hardware/software partitioning. 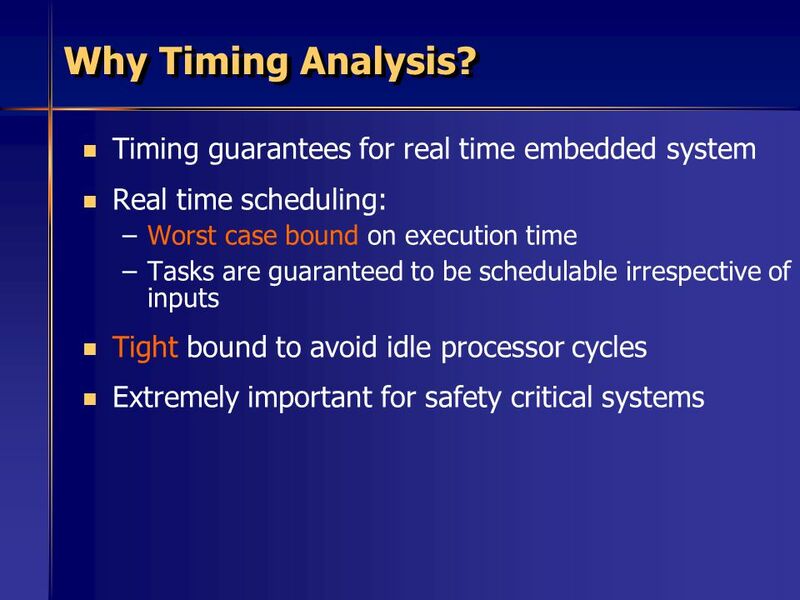  Bus-based systems. 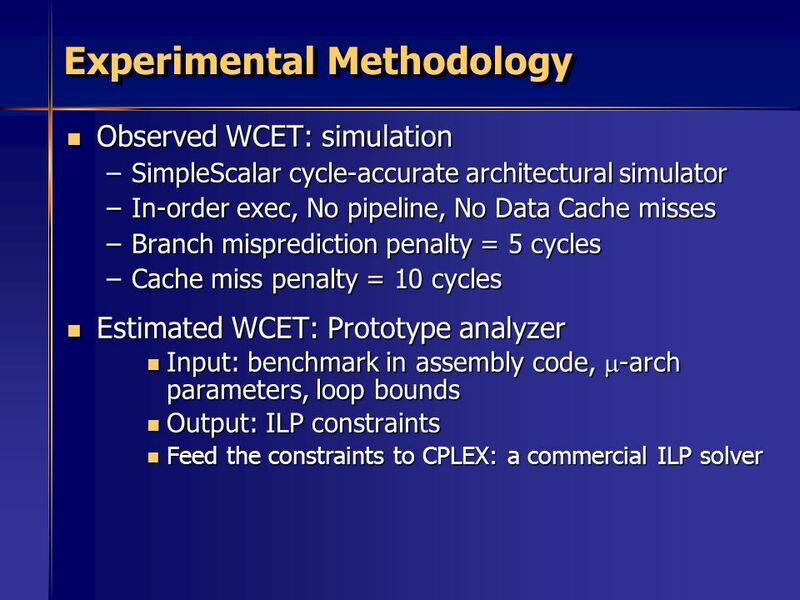 Approximating the Worst-Case Execution Time of Soft Real-time Applications Matteo Corti. 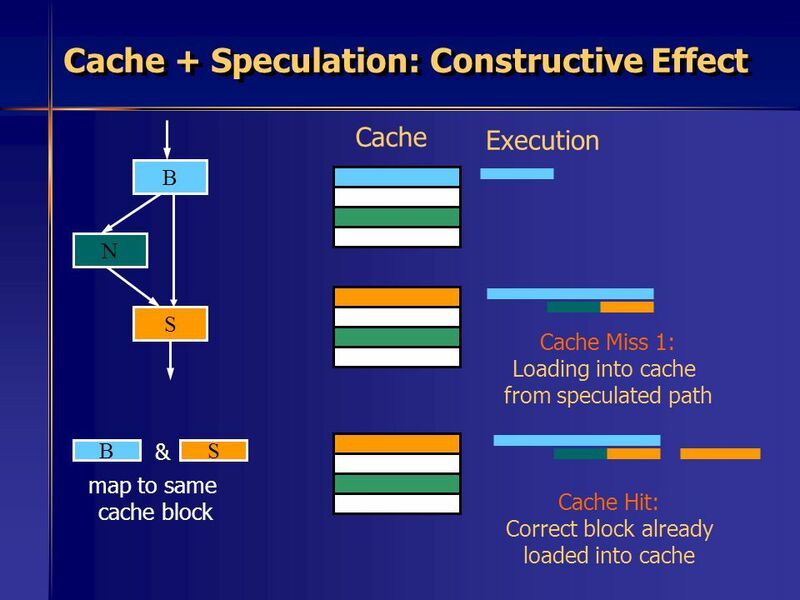 School of EECS, Peking University “Advanced Compiler Techniques” (Fall 2011) Parallelism & Locality Optimization. 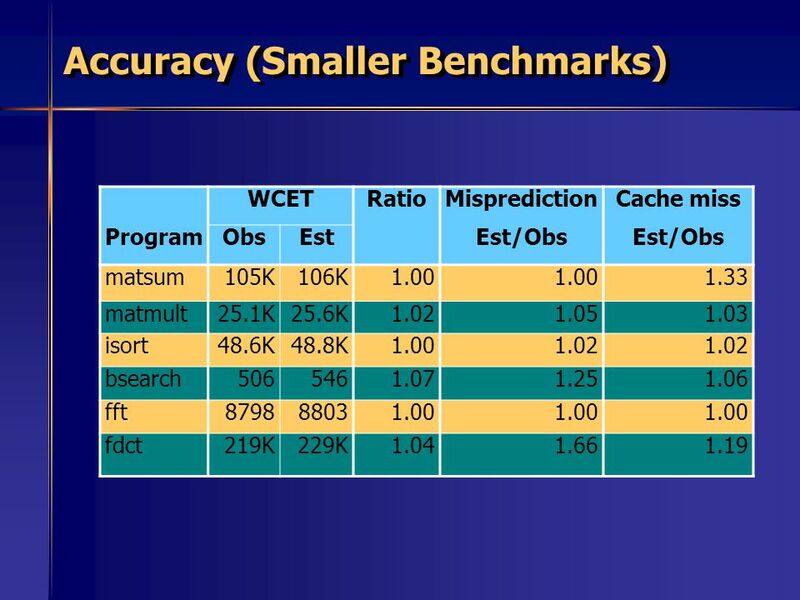 Static Bus Schedule aware Scratchpad Allocation in Multiprocessors Sudipta Chattopadhyay Abhik Roychoudhury National University of Singapore. 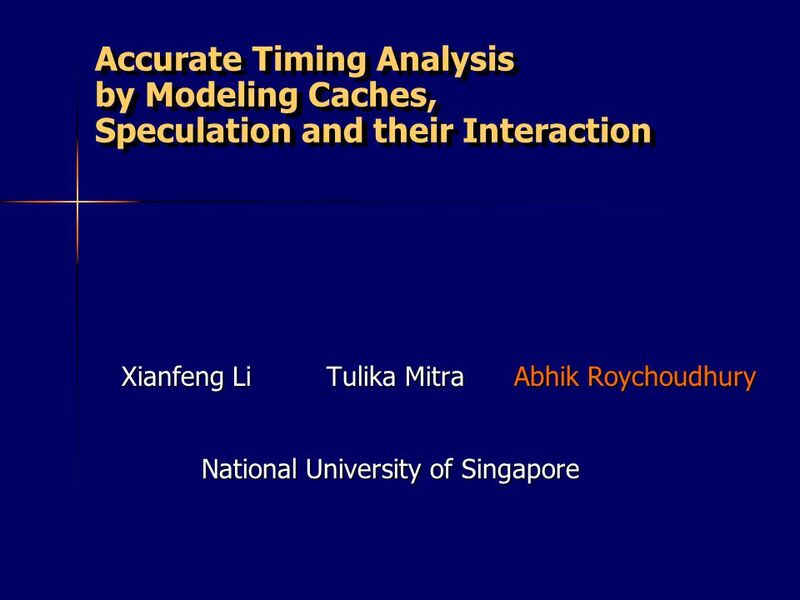 Modeling shared cache and bus in multi-core platforms for timing analysis Sudipta Chattopadhyay Abhik Roychoudhury Tulika Mitra. 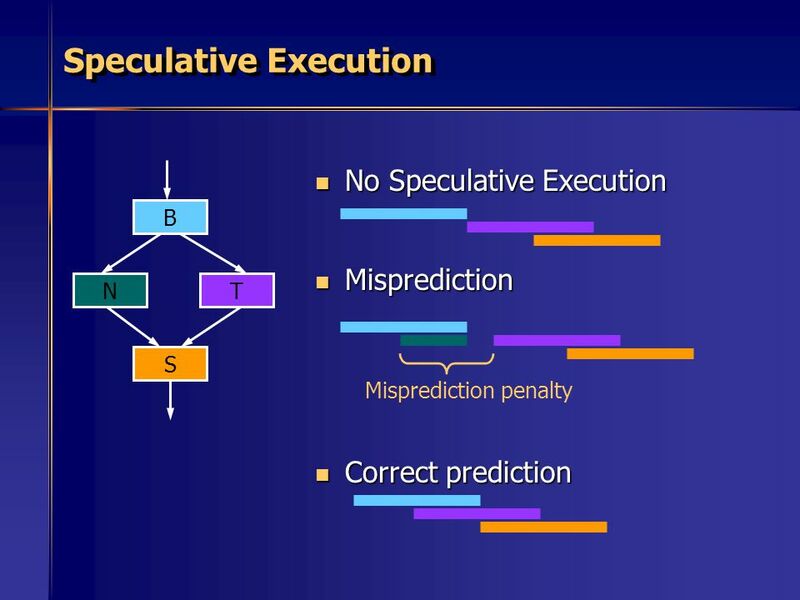 Combining Statistical and Symbolic Simulation Mark Oskin Fred Chong and Matthew Farrens Dept. 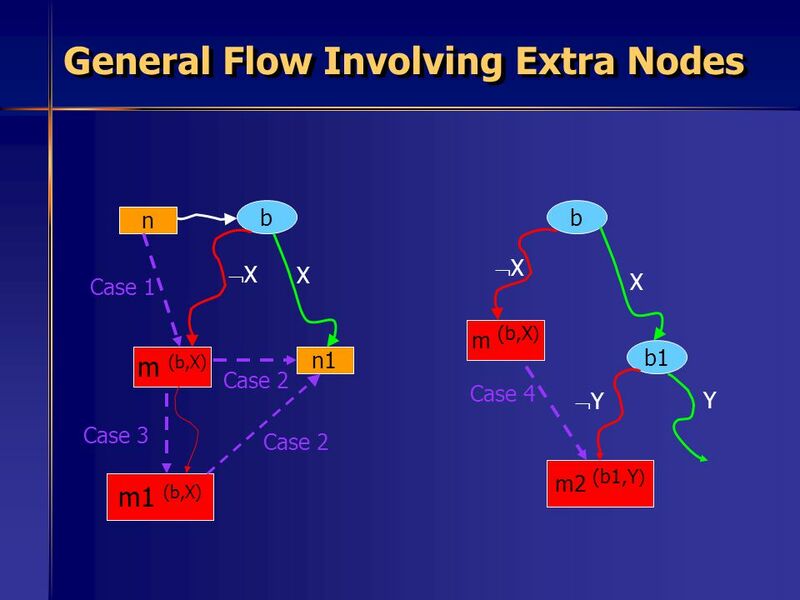 of Computer Science University of California at Davis. 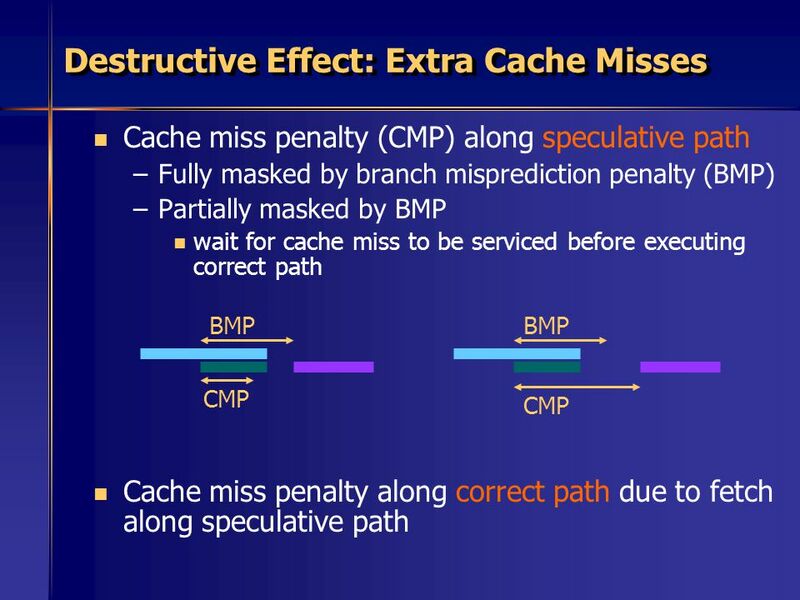 T IME -P REDICTABLE E XECUTION OF E MBEDDED S OFTWARE ON M ULTI - CORE P LATFORMS Sudipta Chattopadhyay under the guidance of A/P Abhik Roychoudhury 1. 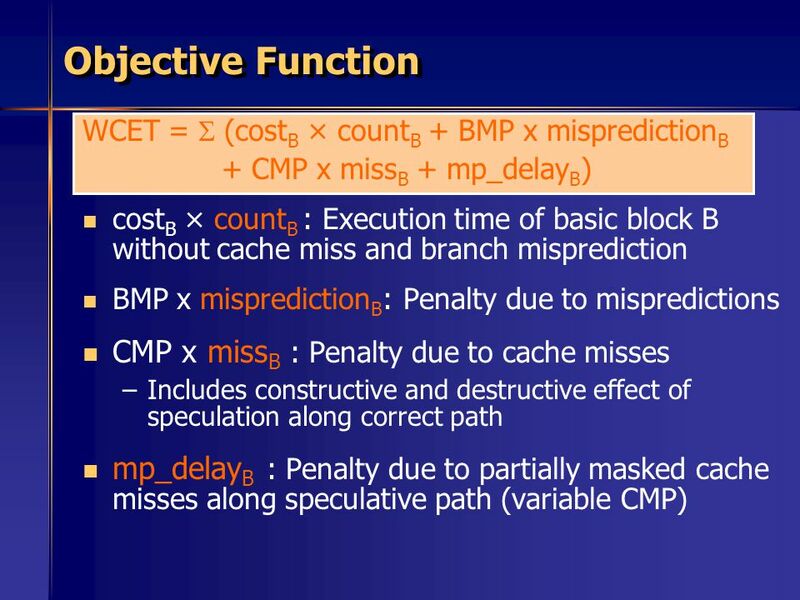 CML Efficient & Effective Code Management for Software Managed Multicores CODES+ISSS 2013, Montreal, Canada Ke Bai, Jing Lu, Aviral Shrivastava, and Bryce. 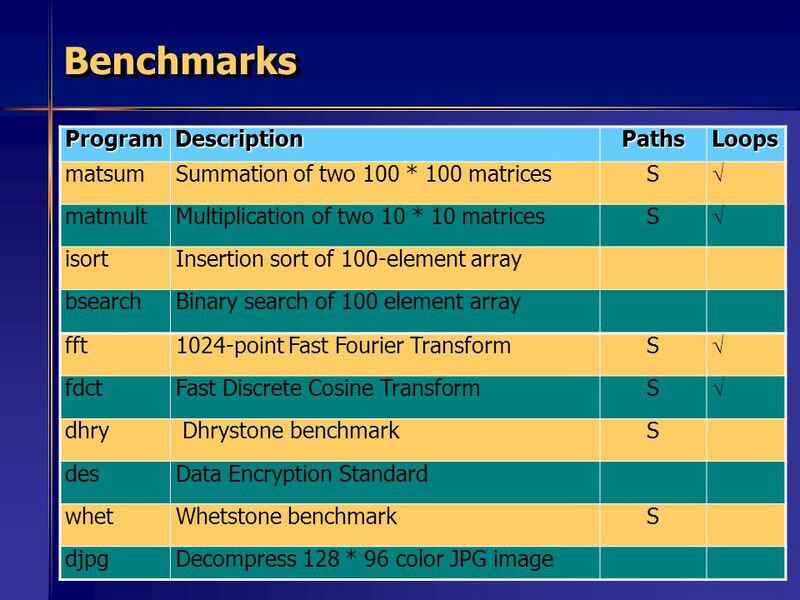 Analysis of Algorithms CS Data Structures Section 2.6. 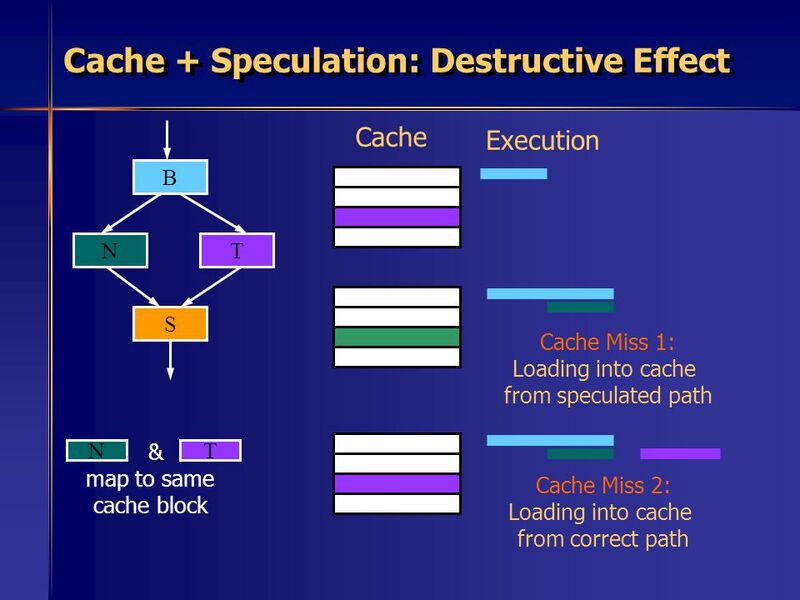 1 Advanced Computer Architecture Limits to ILP Lecture 3. 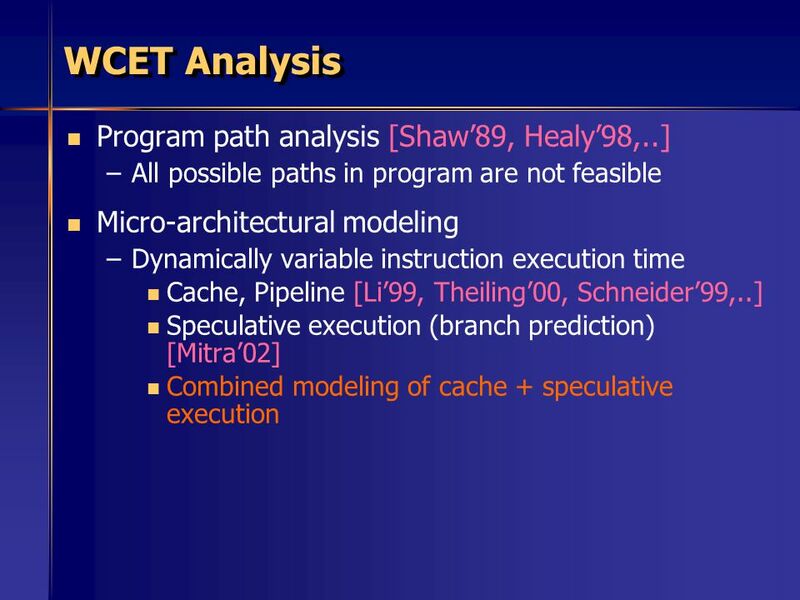 Zhiguo Ge, Weng-Fai Wong, and Hock-Beng Lim Proceedings of the Design, Automation, and Test in Europe Conference, 2007 (DATE’07) April /4/17. 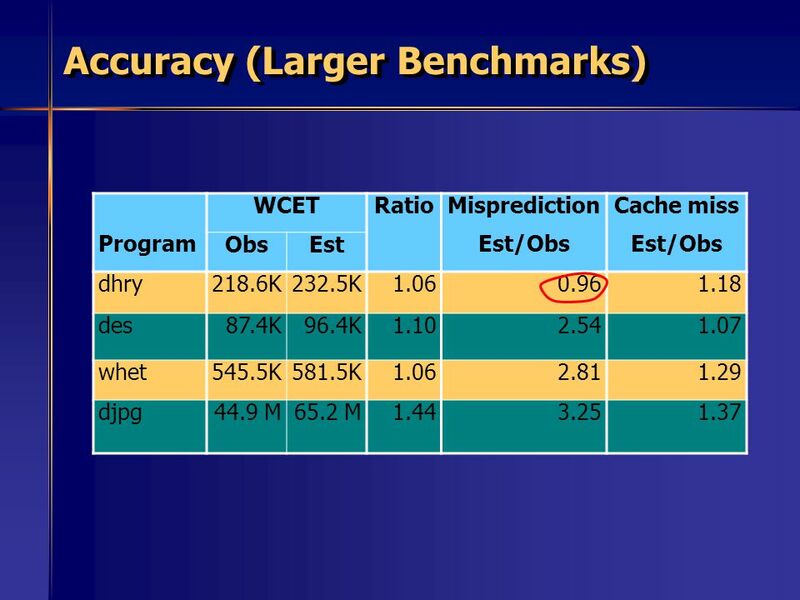 Static WCET Analysis vs. 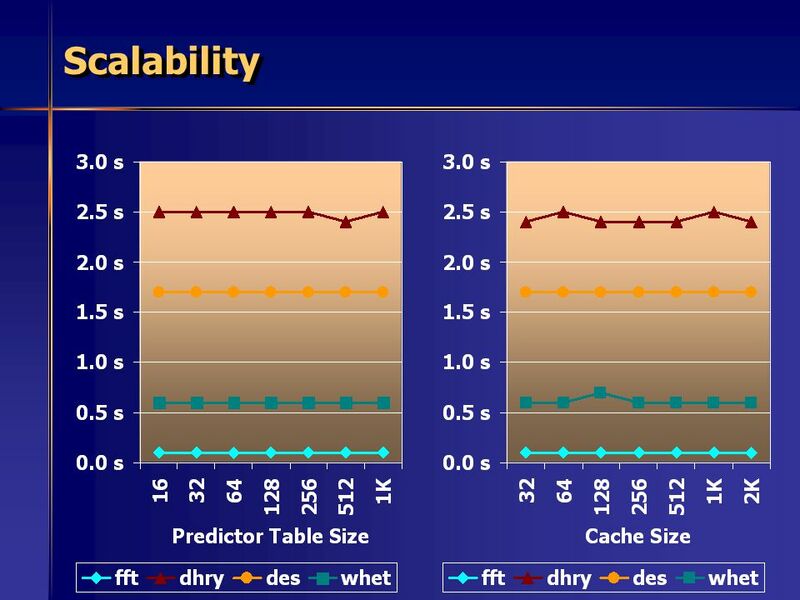 Measurement: What is the Right Way to Assess Real-Time Task Timing? 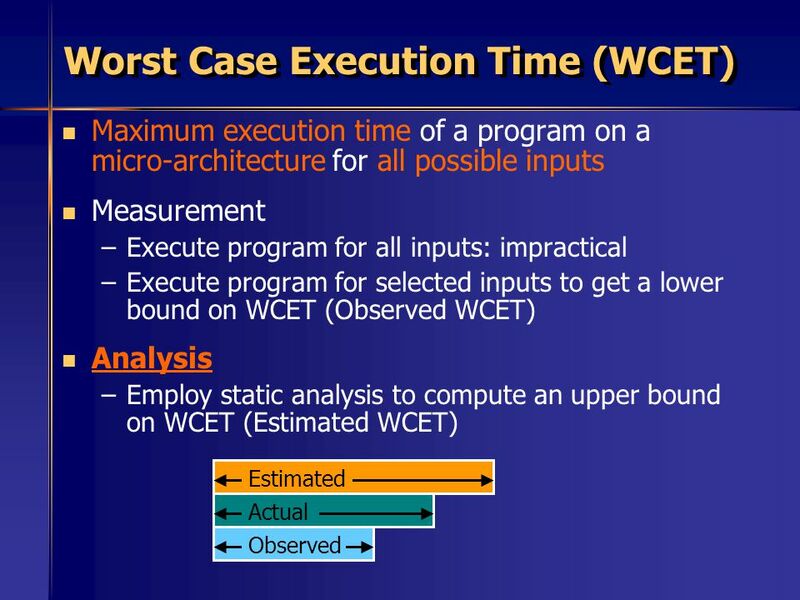 Worst Case Execution Time Prediction by Static Program Analysis.